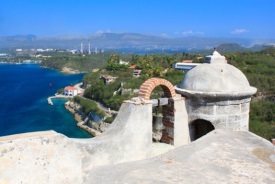 Santiago de Cuba is the second largest city in Cuba and can be found on the south-eastern side of the island. The city has played a major role in the development of Cuban culture over the years with evolution in literature, music, architecture, politics, and ethnology. Set between the Sierra Maestra and the Caribbean, Santiago gets more influence from places outside of Cuba than it does from the capital, Havana. The fast pace and semi-frantic atmosphere of the central district can be off-putting to some, but a little preparation and adjustment has revealed a gem of a city to most.